Can you identify and deal with toxic coworkers? You don't feel good when you are around this person. You know the person is probably gossiping about you, so you do not trust that person. You feel like you are being controlled and belittled. You feel like the person does not respect your knowledge and skills. You are worried about presenting anything to this person because you don't want to expose yourself to unhealthy critique. You (and most other people) avoid talking to this person because you just don't want to hear the complaining. You feel this person is manipulative, so you don't trust the authenticity of the person. What do People Want in a Work (or any) Relationship? In any work, social or family relationship, I believe that most people generally want to have positive interactions that bring positive results. this doesn't mean that giving and receiving critical feedback does not happen- it can and must happen for positive results- it means that the critical feedback be delivered by someone who seems genuinely concerned about the success of the project and about the success of the individuas. To be around people that like or respect them. To be around people that build them up, that help them learn and grow. To have positive, productive interactions with others. To have autonomy in their work and a sense of unity with others in their overall purpose. To be able to succeed. To trust and to be trusted. If people don't have these things, they will eventually move on, even when the project or activity or relationship is interesting or important to them. Sadly, toxic people have excellent knowledge, skills, and experience. They have a lot to offer, but instead of sharing knowledge and building others toward better things, they person belittle others, control the work, and squeeze out the life and potential enjoyment. If you work with someone like this, my advice is to avoid them at all costs. My experience is that you must preserve your own positive attitude, excitement, and self-respect. 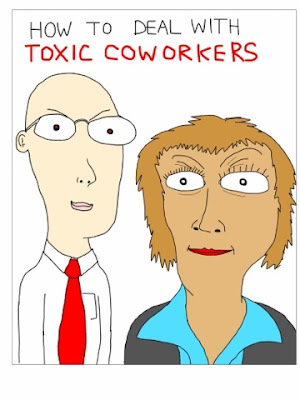 If you work for a toxic coworker, it might be worth moving on to something bigger and better. You probably interact with others every day. And in those interactions, you have a great deal of power to foster positive, proactive, building relationships. You have the capacity to positively influence others and bring them along in your quest for excellence. But you must avoid the toxic attitudes and behaviors that kill healthy relationships. More importantly, we must be willing to contribute to and encourage the success and happiness of others. This wasn't me, was it?